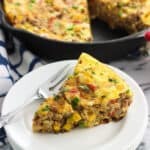 This southwestern frittata is loaded with potato, beef, rice, cheese, veggies, and more for a hearty breakfast, brunch, or anytime meal. Preheat oven to 400°F. Stir together salt, pepper, chili powder, paprika, oregano, and cumin in a small bowl and set aside. Add eggs to a bowl and beat until light and creamy. Set aside. Heat a cast iron or oven-safe skillet over medium-high heat and add olive oil. Once heated, add diced potato and onion and cook for 3-4 minutes, stirring occasionally, and then add the garlic. Continue to cook until the onion and potato are golden-brown, stirring occasionally so that all sides of the potato/onion cook evenly. Add beef, rice, tomatoes, and corn to the skillet and stir, heating everything for a minute or two. Evenly scatter spice mix over top of the ingredients in the skillet and stir. Scatter shredded cheese and diced jalapeno over the ingredients, and then pour eggs into the skillet, lightly stirring so that the eggs are evenly dispersed throughout the filling. Let the frittata cook on the stove top for a few minutes so that the edges set. Transfer skillet to the oven and bake for 10-12 minutes, or until the eggs have set. Let the frittata rest for a few minutes before slicing. Sprinkle chopped cilantro over top for serving.